Do you have a potential business idea and don’t know where to start from? Are you considering starting your own business but you don’t know where to start? Is the idea of setting up a business plan sounding to daunting? Do you think it’s difficult to start a social enterprise? Are you interested in getting to know what is being done to make entrpreneurship more accessible? Do you think starting a business is only available to an elite group of people? If you answered ‘yes’ to any of the above, then join our free half day seminar discussing what is being done and what can be done further to make entrepreneurship more accessible. Sign up to this interactive seminar on the 23rd of March 2018 at 9am. 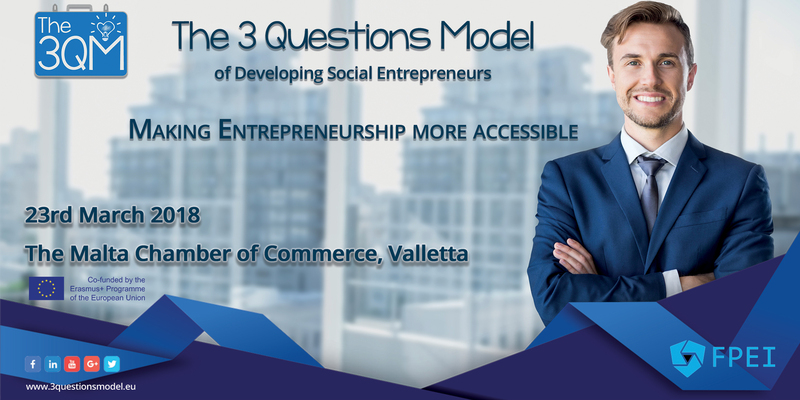 Introduction to the 3 Questions Model and how it can be applied to make entreprenuership more accessible. Interactive and fast paced chat with entrepreneurs, mentors, educators and policy makers. Chat about what funding opportunities exist. Still interested? This event is free of charge but registration is required. Register now!! This seminar is being organised as part of an Erasmus+ funded project called The 3 Question Model (T3QM). T3QM is an innovative way for adult educators to offer high quality and needs focused coaching to (social) start-up founders to become sustainable. T3QM EU will enable aspirant adult entrepreneurs, from backgrounds of need and whom fail to access traditional support, to practically develop their enterprise. It is a new and unique tool for adult education organisations to offer bespoke support which can strengthen local communities and economies. © 2019 FPEI. All Rights Reserved.